The Burn Series Adventure Race and 10K All Terrain Run on October 12, 2019 is now open for business! Check out our amazing ‘Super Early Bird’ and ‘Early Bird’ discount offers and make this the year that you experience the ultimate in Adventure Racing. Photographs are now being uploaded on the Ffotoimage facebook page. If you would like to purchase any pictures please contact Glyn directly through this page. Date: October 13, 2018…RACE DAY! Firstly I must say congratulations to everyone who pitched up today for the Burn Series Adventure Race & 10K. As you all saw we actually managed to escape the majority of the bad weather with most of us not even getting wet….from above anyway! Some good news first…..we are quietly confident that all will go as planned tomorrow having been out on the course for the last two days setting it up. Thank you to everyone for their e-mails and apologies if I didn’t respond to all of them directly – I have been inundated! Margam Park escaped most of the bad weather today and despite small rain showers and occasional gusts of wind we are currently happy with the course, including the kayaking phase for tomorrow. Luckily Margam Park is positioned in a way that the lake is very protected as is most of the course (with the exception of right at the top of the mountain). The weather forecast for Neath & Port Talbot today was much worse than what we actually experienced. Having said that we are aware that over night things could change rapidly with the worst case scenario that the event is run in a non-competitive fashion where you will be allowed to go out on the course but at your own risk. The other good news is that the temperature remains warm and we have a large event centre inside the castle where you are welcome to be before, after and at transition if you wish. Your spectators will be more than welcome here also. As it stands all of the run courses, Burn 10K, Burn & Mini Burn will go ahead as planned. If you are competing with young children you obviously need to consider their ability and whereas you may usually have done the long course on the bike it might be worth opting for the short course on the Mini Burn. We do have a plan B where we still have a long course but with the top section removed. Plan C is to have no long course so that everyone does the short course. For the BURN, The majority of the check points are in sheltered positions throughout the forestry. Plan B is to make any that we feel are in more exposed locations, dummy check points and removed from the course. 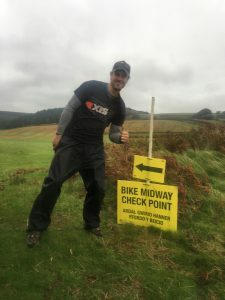 You need to take a decision based on your own ability whether you will reach all of the check points with a head wind as the course is challenging and has purposely been set to make it a challenge even for the most experienced competitors. Nick Kane, the Mtb Manager will be on hand in the morning to answer your questions as well as at the briefing. The Kayak Manager, Neal Fletcher will be paddling on the lake at 8:20am tomorrow morning to assess the conditions. We believe that the wind is going to drop off and hope that by 9:45am, when we are expecting the first Burn competitors to be on the lake, the wind will be manageable. If we do need to take the call to cancel the kayaking then we will still have boats available and Neal will assist you if you do wish to continue. Neal will offer you advice so please listen to what he says. You will receive a full briefing in the morning prior to the race and I will be on hand to answer any questions. Most importantly we want everyone to be safe and secondly we want you to enjoy the event and look forward to welcoming you to Margam Park tomorrow. Our event centre has moved! Due to Storm Callum joining us on Saturday the management at Margam Park have kindly agreed for us to move our event centre into the Castle at Margam Park for this weekends Burn Series Adventure Race & 10K. You will see on the competitors information that the event centre was previously next to the lake where it has been every year but you will now need to COME TO THE CASTLE to register. The Start & Finish will also be from here.